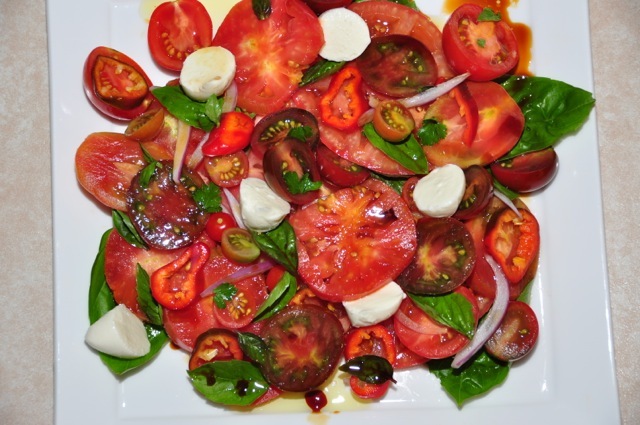 I prefer to use a variety of tomatoes (ie black Russian, Cherry, Yellow Pear, Roma, Vine Ripped etc), to add colour and depth to this perfect tomato salad experience. Allowing this salad to sit for a while after it is dressed and tossed will enable the tomato juices and bocconcini milk to add flavour to the salad. Place tomatoes, herbs, rocket and onion in a mixing bowl, then add a drizzle of oil and vino cotto. Season to taste with salt and pepper. Mix well. Scatter the bocconcini onto the salad and drizzle a little more oil just before serving. Alternatively, you can stack the tomatoes alternating with bocconcini and basil.